Yost Circular Case Co., Chicago, IL. 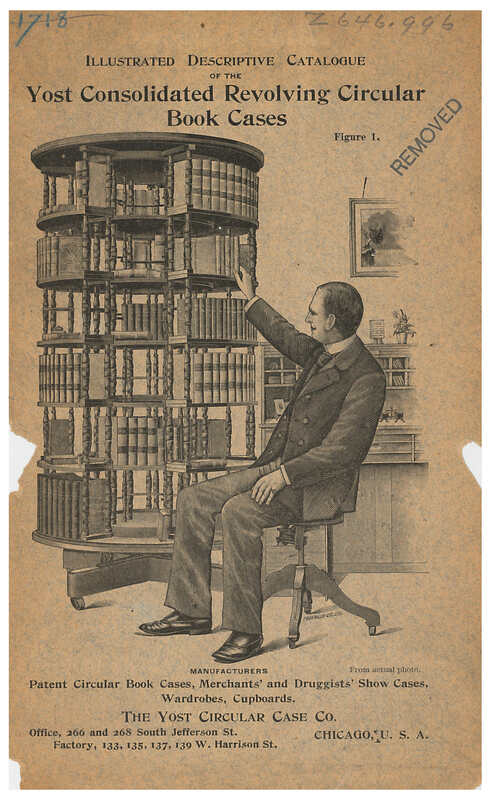 Illustrated Descriptive Catalogue of the Yost Consolidated Revolving Circular Book Cases, circa 1894, front cover of catalog showing a man sitting in a chair pulling a book from a revolving bookcase. 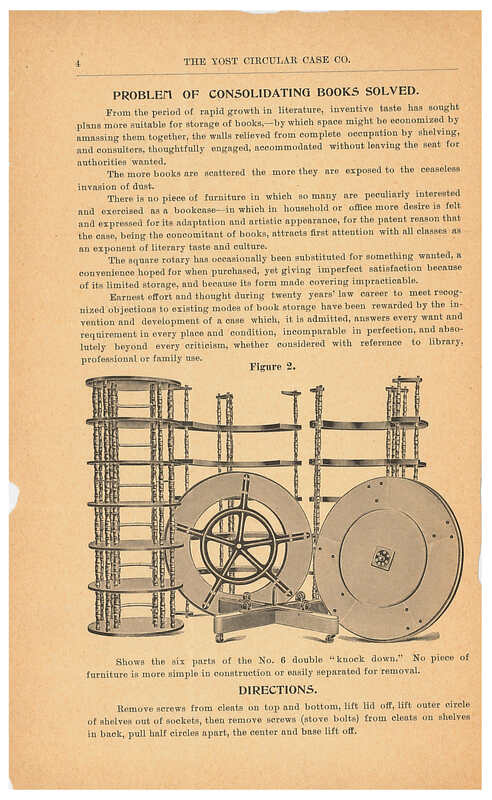 The Yost Consolidated Revolving Circular Bookcase had a circular form and stored books in layers of rings. It was advertised as a system which could consolidate books “in office or household, three, five, or seven deep, or in public libraries five, ten or fourteen deep, and the rear books obtained as readily as those in front, without removal of the front books, the attractive novelty of which must be seen to be comprehended and fully appreciated.” The bookcase, not yet assembled, is shown below. Yost Circular Case Co., Chicago, IL. Illustrated Descriptive Catalogue of the Yost Consolidated Revolving Circular Book Cases, circa 1894, page 4, Yost Consolidated Revolving Circular Book Case disassembled. The double bookcase allowed for shelving books in both an outer and inner circle. The outer and inner circles revolved independently of each other. That meant there was no need to move books on the outer circle to reach books on the inner circle. To pull a book from the inner circle, a person revolved the inner section to the desired spot and then pulled the book out of the door at the front of the bookcase. Shown below is a view from above of the shelf plan of the double bookcase. Yost Circular Case Co., Chicago, IL. Illustrated Descriptive Catalogue of the Yost Consolidated Revolving Circular Book Cases, circa 1894, page 5, view from above of the shelf plan of a double case. Shown below is a diagram with an idea for positioning the Yost Patent Revolving Consolidated Double Circular Bookcases. The diagram is based on a room 46 feet wide with three foot aisles. The bookcases are placed in double rows close to each other. Because the bookcases are in double rows, they naturally become grouped into sections. Each section is represented by a capital letter in the diagram, such as A or B. Each case in the section is numbered, and each shelf in the case is also numbered. That means each section could represent a subject classification and a book could easily be located by knowing the section letter, case number, and shelf number. Yost Circular Case Co., Chicago, IL. 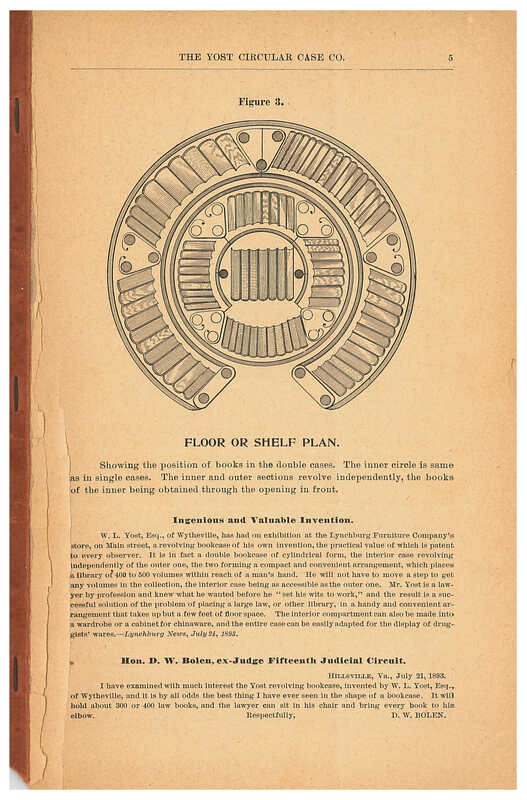 Illustrated Descriptive Catalogue of the Yost Consolidated Revolving Circular Book Cases, circa 1894, pages 18 and 19, diagram and description of a floor plan for libraries using the Yost Patent Revolving Consolidated Double Circular Bookcases. It seems that libraries have always had the challenge of creating more space to shelve books! 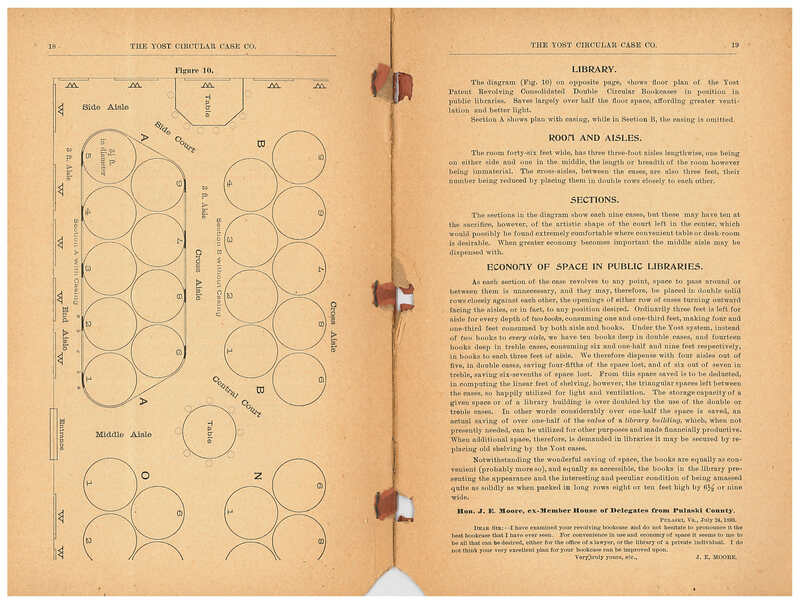 Illustrated Descriptive Catalogue of the Yost Consolidated Revolving Circular Book Cases by Yost Circular Case Co. is located in the Trade Literature Collection at the National Museum of American History Library. Previous Post The Biodiversity Heritage Library celebrates 10 years!